The following conditions are consistent with the laws that govern online trading. The library always gives priority to customer satisfaction by accepting returns for refund unconditionally within 7 days. Free return vouchers are provided on request by Librairie Le Feu Follet. All purchases made ? ?on the site are Edition-Originale.com payable to the order. No product can be shipped to a customer if it has not previously been set to 100% of the proceeds of the sales price as well as any related delivery charges. The Follet reserves the right to suspend any order management and delivery in case of refusal to authorize payment by credit card and / or any other payment by certified financial institution or in case of non-payment and / or fraud and prosecute the perpetrator or perpetrators of the latter. The Follet specifically reserves the right to refuse delivery or to deliver an order from a customer who has not fully paid or a previous order or with whom a payment dispute is in progress of Directors. The Follet reserves the right to pursue all attempts to use fraudulent means of payment and / or settle payment disputes fraudulent or attempted fraudulent payment amicably moyennent a customer's payment of the amount due, plus costs of potential issues. By credit card VISA, American Express, Mastercard: Edition-originale.com offers two service Online payment: by credit card, totally secure, managed by Banque Martin Maurel-and paypal. The entire payment process is fully encrypted and protected. The protocol used is SSL coupled to the electronic banking. This means that the information related to the order and the number of the bank card does not circulate on the Internet, and only the relevant banking organizations can access it. 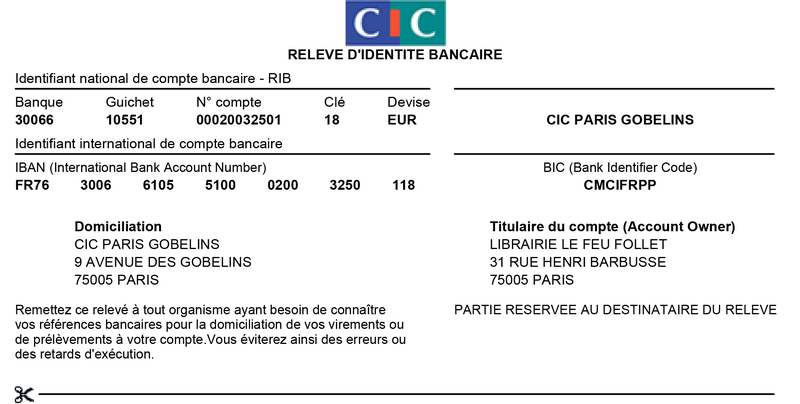 By cashable check in France: the cashing of the check is made ? ?to order. Cash: only in store, the cash shipments by post is prohibited. When your payment, you can either set the cost of delivery or choose to pick up your object in our library, or even send us a carrier of your choice (in which the transport is under the respinsabilité the buyer). Shipping charges are automatically calculated based on the destination and the weight of the object. These costs include the costs of packaging and insurance. Delivery times vary between 24 and 7 days (for details see the " Shipping and delivery rates "). Shipping is done the first working day after the date of the order (no later than two business days). Delivery times are those indicated by the postal service, and their sole. The library can not be held responsible for non-compliance with these, the shipping date on the deposit slip authentic. However, the library will take back and refund any order including delivery would not give complete satisfaction. A detailed invoice will be sent with your parcel. If the object is to be shipped outside of France, we can take care of administrative procedures (customs, certificate of freedom of movement ... The remaining related costs to the customer). If you have a question or if you want to be, you can contact us either by email or by phone. We will reply as soon as possible. We also send additional photos on request. The site presents Edition-Originale.com books for sale with the features necessary to allow compliance with Article L 111-1 of the Consumer Code, which provides for the possibility for the potential buyer to know before the final order the essential characteristics of the books he wants to buy. However, if the work did not meet the expectations of the customer, the customer can return it against refund the cost of the book (a good free return is provided on request, no additional shipping cost can be attributed to the library). Documents associated with the products presented on the site Edition-originale.com (description, specifications, photographs, etc ...) are indicative and do not commit the Follet about compliance with the product reality, can not challenge the validity of an order or a sale. The prices are also indicative: they can change at any time and no technical or even typographical error may not entitle to claim from the customer or can not engage the responsibility of the Follet. The selling price used for the purchase of a product corresponds to that seen online at the time of registration of the order on the Edition-Originale.com website (except for typographical or photographic errors). Books and prices listed on the site Edition-Originale.com are valid only in the stocks and do not give rise to any compensation in case of termination or cancellation. Books Sale prices are in Euros all taxes (€). According to the article of the CGI, the VAT is not applicable. As of the date of delivery of your order, you have a period of 7 days to exercise your right of withdrawal. Return items must be in the insured package to the value of the invoice, in the case of a shipment without insurance the Follet can not be held responsible for loss or theft during transit. The Follet remains owner of the goods until full payment by the customer. The transfer of ownership of the books to the customer is made ? ?at the time of full payment. However, during the period of delivery to the transfer of ownership, the risk of loss, theft or destruction is the customer. The Follet is committed to protecting the privacy of the customer placing an order on the website Edition-Originale.com and processes information on the strictest confidentiality. In a purchase made ? ?by the customer, only requested for information (name, address, e-mail, etc ...) for quality treatment and careful monitoring of the order. These online data entered is stored on a secure server and is immediately encrypted. The personal data will never be disclosed to anyone. Pursuant to the CNIL, the client has a right to access, modify, rectify and delete data concerning him (article 34 of the law "and Freedoms" of January 6, 1978). Librairie Le Feu Follet is a limited liability company with capital of 8,000 euros, whose registered office is 31 rue Henri Barbusse 75005 Paris, registered under number RCS Paris B 412 079 873. VAT number: FR45412079873. Librairie Le Feu Follet is the site editor Edition-originale.com and owner of the domain name. Librairie Le Feu Follet holds the domain name www.edition-originale.com. Edition-originale.com The site is a work of authorship protected by the laws of intellectual property. The site as a whole and each of its components (such as text, photographs, illustrations, etc.) are the exclusive property of the Librairie Le Feu Follet, which alone is authorized to use the intellectual property rights relating thereto. When using a "share" function available on the website in order to discover a reference Librairie Le Feu Follet on social networks, you acknowledge and agree that content available shared should only be used as part of a purely personal use, excluding any commercial use on websites or pages and / or other digital support for commercial use. The creation of hypertext links to the site can only be made ? ?with the prior written permission of Librairie Le Feu Follet, which authorization may be revoked at any time. All sites containing a hyperlink to the site Edition-Originale.com are not under the control of the Librairie Le Feu Follet and it therefore accepts no liability (especially as publisher) on access and content to these sites . The Follet is free to change at any time and without notice, the contents of the site. Librairie le Feu Follet strives to best ensure that the information accessible through the website is accurate and updated. However, La Librairie le Feu Follet not in any way guarantee that such information is accurate, complete and current. Librairie le Feu Follet implements means for ensuring the security of files from the personal data collected on the site. Librairie le Feu Follet does not control the risks associated with the operation of the Internet and draws your attention to the existence of potential risks in terms of confidentiality of information transmitted via this network. The prices displayed on the Edition-originale.com website are quoted in Euros. According to the article, no VAT is applicable. These statements are prepared in accordance with French law, including the provisions of Law No. 2004-575 of 21 June 2004 on Confidence in the Digital Economy and Law No. 78-17 of 6 January 1978 amended by Law No. 2004-801 of 6 August 2004 and Freedoms. Parisian French courts have territorial jurisdiction to hear any dispute relating to the Site. The general conditions of sale presented above are governed by French law. Any dispute relating to these terms and conditions shall be subject only to the Commercial Court of Paris.